I am a TKGA certified Master Knitter, Tech Editor and Knitting Instructor. I am also a current Co-Chair of the TKGA Master Hand Knitting committee, the managing Editor of the K2TOG newsletter, and a member of the Cast On editorial committee. I have been designing knitwear and teaching knitting since 2007. My family keeps me busy, since I'm a stay-at-home and homeschooling mom of 2 boys. When I am not knitting, designing or teaching (my boys or knitters!) I can be found spinning yarn, reading or in the outdoors camping and hiking with my family. WiP Wednesday 11/21/18, G.A.L., and Happy Thanksgiving! I have a couple of WiPs I’m working on – I’m working up a set of watch cap hats for a Brioche class I’m teaching in March. I have the adult and the infant done so far – I’ll cast on for the child size in the next day or two. I think I’ll add an adult large as well, although the adult size is nice and stretchy so I might not. We’ll see! I’m also knitting up swatches for an article I’m writing for the next issue of Cast On magazine. There’s nothing exciting there yet. I’ll be writing two patterns to go along with that article as well. Speaking of Cast On, did you see the most recent issue? 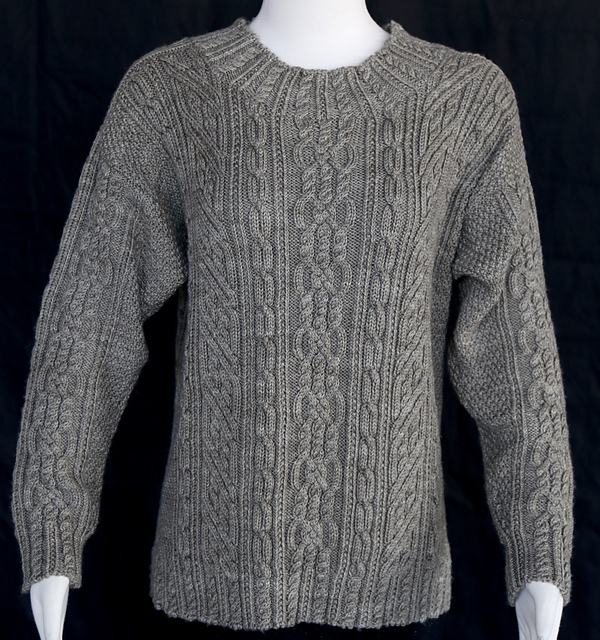 My cabled sweater was published in it! ‘Harmonious Echo Pullover‘. I recently self-published a few things that had rights reverting back to me: my Quatrefoil Shawl, my Zick Zack Fingerless mitts, and my Wheat Chain socks. I did that because something fun is coming up in a few days and I wanted a few more patterns available …. the Indie Design Gift-A-Long 2018! This will be my 3rd year as a participating designer in the GAL fun! For the first 7 days there is a sale, but the real fun lasts for all 6 weeks with people knitting and crocheting gifts for prizes. There are all kinds of fun and games going on! You should check it out and join in the fun – I know I will! That’s it from me for now – I’m finishing up my Thanksgiving cooking (we’re having our big dinner tonight) and I’m ready to eat and watch some holiday movies with my clan. I hope you and yours have a very Happy Thanksgiving!! I finished up my sweater design, and just in the nick of time, too! 🙂 I can’t wait for you to see it – it’ll be in the next issue of Cast On magazine, so you’ll have to wait just a little bit longer! As part of my sweater, I used the Channel Island Cast On method, and for the neckline I really wanted the bind off to match as close as possible, so I used a Channel Island Bind Off method. It doesn’t match 100%, but it’s pretty close. At the end of the video where I say to use a knot to end – I mean to make the knotted stitch, and not end with a yarnover. I hope these tutorials help – it’s always a good idea to have multiple cast ons and bind offs in our knitter’s toolbox!! What do you think of these methods – have you used them before? Leslie Ann Bestor, Cast On Bind Off, pages 56-58. Cap Sease, Cast On Bind Off, pages 42-44. Now that my deadline design knitting is done, I have some much-needed free time to get some other knitting done! 🙂 Like my Vitamin D cardigan… and I have a lace shawl design that I want to start on as well. So I should have some things to show you for a WiP Wednesday next week.